Before introducing you to Rob, a word to the savvy wine shopper: Go out and find some Mercer Merlot. It's wines like this - and from this region - that will be responsible for Merlot's redemption. Also go out and find some Dead Canyon Cabernet. These are wines to get excited about. Meet Rob. Rob's the kind of guy you're really glad wasn't on the scene when you and your wife started dating. His list of qualities is tough to compete with: handsome and wholesome, he's rugged in a quiet kind of way. Successful and hard-working, his easy smile conveys at once confidence and humility. Add to that he's also a Marine scout sniper and winegrower and you begin to wonder if this character isn't something out of a Vince Flynn novel. You'd hate him for being such a chick magnet if he weren't such a decent guy. But you're really glad that he's on the scene now, because his wines are going to put a smile on your face. Like Rob, these wines also exude universal likeability. Located in eastern Washington, where daylight can last 17 hours a day in the summer, Mercer's 12,000 acre ranch is planted to a growing number of varieties. We've covered most of these wines before, but it was great to revisit the portfolio, revise impressions, and have a chance to hear stories from the horse's mouth....starting with how the winery came to be. Like all good tales, this one starts with a few booze-fueled poker hands at Rob's ranch: fertile ground for big plans. After enough hands (and bottles of wine), Rob and longtime friend Ron Harle decided to join forces. From this fermentation-inspired germination, Mercer Estates was born. It's not like grape growing was new to either of them, but the idea of constructing a winery operation at the beginning of a global financial meltdown was, well, a risk. Risky or not, quality and value cannot go ignored for long. With veteran vintner David Forsythe at the helm it's no surprise things are going well for Mercer. Moving around 20,000 cases of wine into 30+ markets, these should be easy to find wherever you are. Merlot. $19. This time it was 2007 vintage and it has everything: ripe fruit, backbone, structure, and polish - all for under $20. A risk-free choice to accompany a fat grilled ribeye. As indicated in the into, get some. I did. Chardonnay. $16. Though liked enough the first time around, allowed to warm up a bit, this shines as a high quality product and delivers terrific bang for the buck. I asked Rob why they aren't getting $8 more per bottle. Riesling. $13. Bang: dead on varietal characteristics. A little less sweet than first impressions, but more for those not averse to a little residual sugar. Sauvignon Blanc. $13. Richer than previous tasting, though still tight and crisp, and refreshing. No heat. Pinot Gris. $13. Redemption. Last bottle must have been bad. Fruit is there and acids take a back seat. Balanced and delicious. 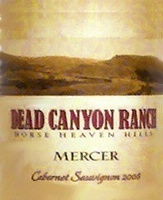 Finally, we tasted the 2008 Dead Canyon Ranch Horse Heaven Hills Cabernet. At $15, you simply will not find a better value in single vineyard Cab. Wow. Spice, cedar, lovely, and exciting. Ageworthy. Incredible value. Needs time to breathe, but shazam. It won't be long before these wines are more broadly recognized for the terrific values they are. In the meantime, beat the rush and stock up. Cheers.